Alan and Brian Beaulieu, the "Vistage economists," had a year-end podcast filled with tidbits designed to give a preview of 2014 based on data and facts from recent times. 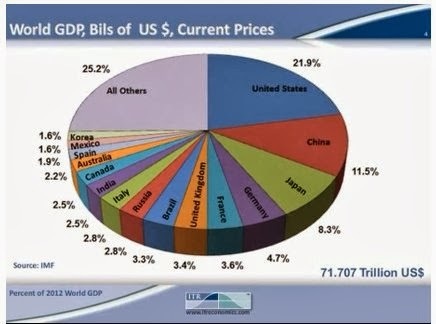 This 2012 chart shows that the U.S. continues to hold the largest share of World GDP at 22%. China follows at 11.5%. It's noteworthy that the U.S. gained in 2012, indicating that China's continued growth did not come at the expense of the U.S. That's news. They added that Canada is losing manufacturing GDP to the U.S. and Mexico. In both a demographic and economic way, they added, "Mexico is young and growing."